I don’t make a habit of taking financial advice from professional football players. No offense to the gentlemen suiting up for Monday night football this evening, but athletes aren’t known for being paragons of financial virtue. Sports Illustrated reported a while back that 78% of ex-NFL players were either bankrupt or in financial stress within two years of retirement. And it’s not just football players. Kareem Abdul-Jabbar, one of my favorite basketball players as a kid, lost everything after taking lousy advice from an unscrupulous advisor. 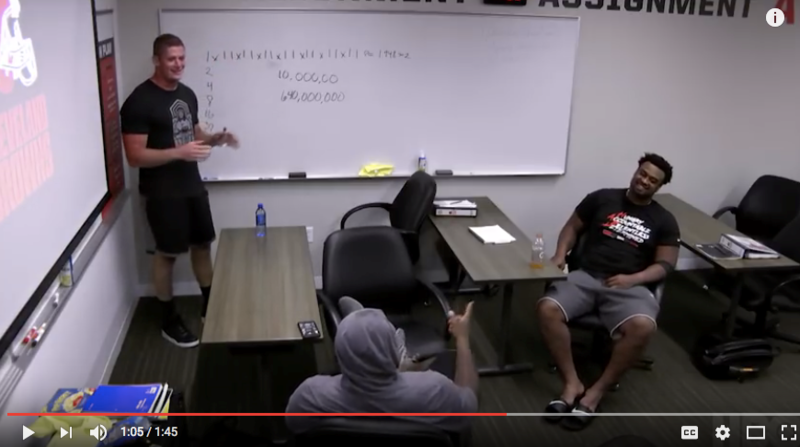 So, imagine my surprise when I caught a video of Tampa Bay Buccaneers defensive end Carl Nassib standing in front of his former Cleveland teammates this preseason explaining the power of compound interest. In language any red-blooded American male would understand, Nassib explained that he wanted to buy a new Rolex to try and impress pop princess Taylor Swift. But after considering what that money would be worth if he let it compound for 40 years, he thought the better of it. “You’re telling us all we got to do is put $100,000 in the bank and let it sit there?” one of his teammates asked. “Yeah, don’t touch it. It’s called interest,” Nassib said. Now that’s a tightwad after my own heart! Miss Swift would have likely been more impressed with Nassib’s knowledge of compound interest than with a flashy watch. She’s reportedly worth over $300 million herself and is considered a savvy business woman and investor. Russell, who penned the Dow Theory Letters for nearly six decades, was one of the most respected financial writers in history, and “Rich Man, Poor Man” is his most influential piece. I plan on making both of my sons memorize it once they’re old enough to understand the basic math. Russell used the example of two young men. One started contributing $2,000 per year to his IRA at the age of 19 and stopped investing new money at age 25. He never invested another penny after turning 26. The second young man started contributing $2,000 per year at age 26 and continued to do so for the following four decades. Both enjoyed 10% annual returns. At the age of 65, guess which one had more money? …despite the fact that the second young man invested nearly six times as much money over amuch longer period of time. If you don’t believe me, open a spreadsheet and do the math. (Or just look here.) I didn’t believe it the first time either. Just for grins, I wanted to see if the numbers still work today. When Russell first wrote the article, IRA contributions were limited to $2,000 per year. Today, the same two young men could invest $5,500 per year. Now, the amount of the contribution doesn’t affect the outcome. Whether both invest $2,000, $5,500 or $5.5 million per year, the young man who started earlier always finishes ahead under Russell’s assumptions. But are the assumptions themselves realistic? Can someone investing today really hope to earn 10% per year over the next 45 years? I have my doubts. So, let’s see what the numbers look like if we assume 7% per year, which I consider more reasonable. Assuming a 7% annual return, the young man starting at 19 would need to contribute for an additional couple of years in order to come out on top. But he could still quit investing at the ripe old age of 29 and beat the young man who started at 26 and continued to 65. Playing with the numbers, the young man that started investing his money at age 26 made four times his money. But the young man that started investing at 19 multiplied his original investmentby a factor of 17. It pays to start early. The lower the assumed rate of return, the longer the 19-year-old has to contribute in order to come out on top. For example, lowering the assumed annual return to 5% would mean the 19-year-old would have to continue contributing until age 32. But the lesson is clear: Time is your greatest ally in accumulating wealth. By age 40, you’d need to invest $24,367 to make up for that $5,500 contribution you didn’t make when you were 19 (assuming 7% annual returns). By age 50, the number jumps to $47,934. And it just goes up from there. Of course, that knowledge doesn’t do you a lot of good if you’ve already got a little gray in your hair. You can’t go back in time and force your younger self to invest. But you can sit down with your children or grandchildren and explain to them how compound interest works. Do the math. Show them what the money they want to spend on that new PlayStation game would be worth in 20 or 30 years if they invested it instead. And make sure you check out your latest issue of Peak Income, where I recommended my latest high-yielding income investment.